B abar Ali Delair Jang succeeded to the Masnad (throne) after the death of his father, Mubarak-ud-Daulla, in 1793 AD. Lord Wellesley, the Governor General, assured him that he would be ready at all times and happy to exert his interest to promote the peace and comfort of the Nizamat and to maintain the splendor and uphold the dignity of the Nawab's exalted Court. Sir John Harrington was instructed to attend the auspicious assembly of the Nawab's succession to the Nizamat and to acknowledge His Highness on behalf of the Government as Subhadar of the three provinces of Bengal, Bihar and Orissa. Babar Ali received the imperial title of "Nasir-ul-Mulk, Azud-ud-Daulla, Delair Jang (Helper of the Country, Arrow of the State, Brave in War)". “ Before this, a letter of condolence was written. Now the honourable members in Council have decided that your Highness, who is the eldest son of the late Nawab, and in whose abilities and good behaviour and fitness this Government has full confidence, be acknowledged as Subahdar of the provinces of Bengal, Bihar, and Orissa. “ Accordingly, Sir John Harrington has been instructed to attend the auspicious assembly of your Highness' succession to the Nizamat Masnad, and to acknowledge your Highness on behalf of this Government as Subahdar of the three provinces. He is also directed to give publicity of the same to the people at large, by notification and proclamation, and to fix the date of installation in consultation with your Highness. It has been unanimously decided in the Council that the system of the distribution of the Nizamat stipend (namely sixteen lakhs of rupees), as it now exists, in accordance with the circumstances and rules laid down in the scheme, detailing the payment of the amount of the allowance of each individual dependant of the Nizamat, and the liquidation of debts, as sanctioned by the Directors of the East India Company, will hold good and remain upon the same footing in your Highness' case. The Nawab, after the accession, dismissed Khalifulla Khan from the Nizamat Dewanship, and appointed Rai Muhammad to the office, with a salary of Rs. 3,000 a month, and the title of "Rai Bahadur". 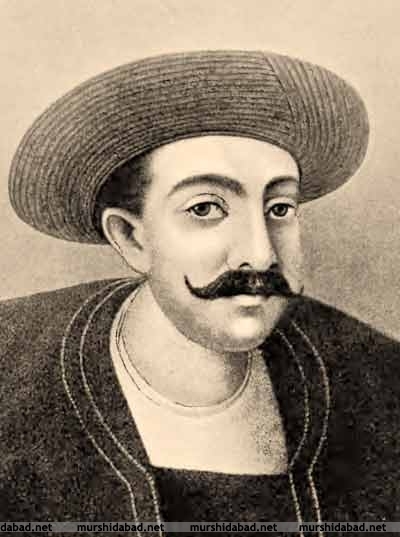 Babar Ali died on 28th April, 1810 AD. He was unrivalled for his liberality and generosity, and especially for his kindness and favour to his chief dependants. He was very fond of tonics, in the shape of Kushta (of gold, etc.). He always searched for and inquired after Jogis and others, who were experts in the making of "Kushtas". He always visited the sacred tombs, especially the Kadam Sharif. He performed the "Taziadari" (Tazia Rituals) with great veneration. Babar Ali had two wives. He married (first) Babbu Begum Sahiba, daughter of Muhammad Sami Khan. He had two sons.